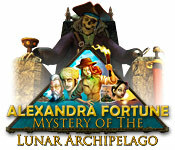 Also available: Alexandra Fortune: Mystery of the Lunar Archipelago Game Walkthrough. Alexandra Fortune: Mystery of the Lunar Archipelago may be downloaded and purchased for $6.99 with a Big Fish Game Club membership. A demonstration version (193.41 MB) may be downloaded and played for free for one hour.